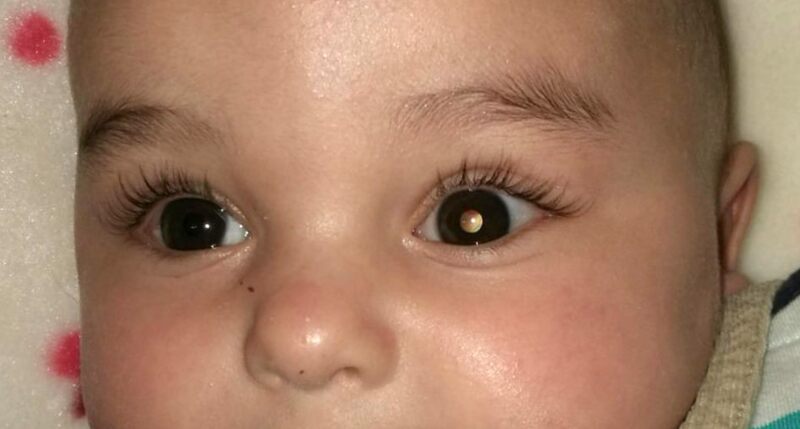 One of the patients affected by a retinoblastoma with leukocoria, a symptom of the ocular tumor. A team of researchers from SJD Barcelona Children’s Hospital has developed a new experimental treatment for retinoblastoma or tumour of the retina, a disease that accounts for 11% of malignancies in children under one year old. The treatment consists of injecting a genetically modified virus into the eye affected by the tumour. The virus seeks out, attacks and destroys cancer cells, and is for use in children whose tumours do not respond to conventional treatments. The work appears on the cover of the prestigious journal Science Translational Medicine and has earned one of the most prestigious awards in the paediatric oncology world: the Odile Schweisguth Prize awarded by the International Society of Paediatric Oncology (SIOP). The research has experimentally reproduced tumours obtained from patients who had not been cured with the treatments currently available. Researchers at SJD Barcelona Children’s Hospital and the biotechnology company VCN Biosciences have shown that the VCN-01 oncolytic virus, developed by genetic modification of adenovirus type 5 - a common virus that normally causes cold-like symptoms - is only capable of infecting and multiplying in tumours and not in healthy cells of the retina. The virus’s selectivity for tumours is based on the abnormal functioning of the retinoblastoma gene (RB1) in the cells affected by the tumour, in which there is an increase in the free amount of a molecule called E2F-1. SJD Barcelona Children’s Hospital has begun a clinical trial, led by Dr Guillermo Chantada, Dr Jaume Catalá and Dr Jaume Mora, to treat patients with chemo-resistant eye tumours with the VCN-01 oncolytic virus. The objective of this experimental study, in which VCN Biosciences is also participating, is to describe the safety of the treatment and obtain the first indications of its clinical efficacy. Retinal cancer is diagnosed in 8,000 children around the world each year. It is the most common ocular cancer in children. Currently, when ocular preservation is indicated, children receive intra-arterial chemotherapy in a first phase, which is administered through a long, thin catheter introduced through the femoral artery (in the groin) and running to the ophthalmic artery, where it then administers the chemotherapy locally. Sometimes, chemotherapy drugs are injected directly into the eye, into the vitreous humour. In 30% of cases, however, the tumour does not respond to either of these treatments and ophthalmologists have no other option than to remove the affected eye to prevent the cancer from spreading to other organs in the body, since if this occurs, the likelihood of a cure is very low. The new viral treatment aims to prevent the removal of the eye and reduce cases of blindness in patients with retinoblastoma. This new treatment belongs to a group of new advanced therapies that are being implemented by SJD Barcelona Children's Hospital and that represent a new paradigm, allowing personalised treatment for some types of cancer. The hospital has launched several clinical trials based on innovative therapies aimed at the treatment of diffuse brainstem glioma (a cancer that is currently incurable), retinoblastoma (cancer of the retina) and type B acute lymphoblastic leukaemias, treated with CART-19. These lines of work are also framed in the future project SJD Pediatric Cancer Center, conceived as a center for assistance and translational research, aimed at the implementation of innovative therapies.